Isn't this the definition of a teacher? Grabbing scraps of discarded paper from a local university; onto these scraps, with a permanent marker, writing problems that cover your state's math curriculum; "borrowing" a daughter's Halloween Gum-Ball Machine costume to make vinyl pockets to hold these problems. 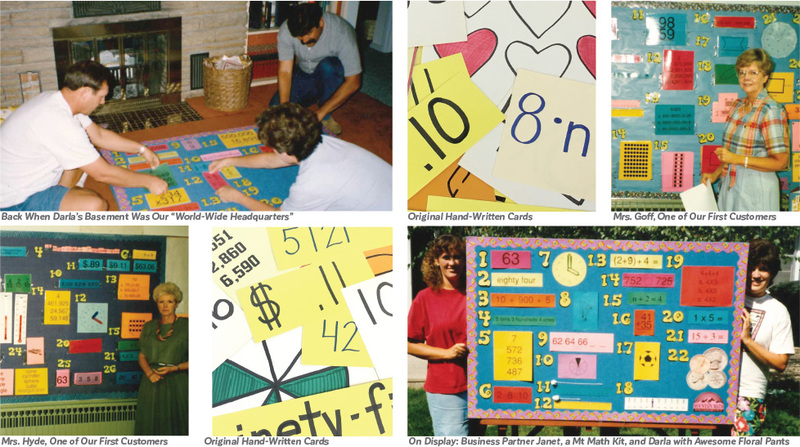 From this creativity, ingenuity, and problem-solving grew the very first Mountain Math Bulletin Board! What was the problem she needed to solve? Like all teachers, Darla followed the tried-and-true teaching method of tell/show/do. She introduced new concepts with great lessons, she showed how to apply them with fun activities, and she had the students prove their comprehension through application. Yet, one question nagged at her: how do my students RETAIN and MASTER the concepts I have taught? As a second-year, third-grade teacher, Darla wasn't satisfied with her review options: end-of-year reviews felt like teaching the concepts all over again; end-of-chapter reviews didn't provide concept mastery; and, cumulative reviews were too infrequent and too spread out to have lasting effects. She realized that a daily, spiral review was and is the answer to concept RETENTION and MASTERY. How does a teacher find the time to start a company? After implementing Mountain Math in her classroom, not only did Darla notice her students' increased RETENTION and MASTERY, but so did other teachers, principals, and district administrators, who wanted to know why her students' assessments were significantly higher than the others. For two years, she worked on correlating each grade level with national math standards. In 1991, she started Mountain Math, LLC selling at state conventions. Word spread and now Mountain Math can be found all across the country and the world as teachers and students enjoy the benefits of daily review. Twenty-six years later, Mountain Math is not only known for its daily review in math but also in language and science. Its product list has increased and changed but its great daily review remains the same. Where does the "Mountain" come from in Mountain Math? Ogden Utah is a great mountain town that is nestled between the Great Salt Lake and Wasatch Front. Standing anywhere in the city, one is dominated by Mount Ogden Peak, Lewis Peak and Ben Lomond Peak. It was an easy metaphor for Darla to visualize: CONCEPT MASTERY is a hike to the top--both satisfying and challenging. Mountain Math's Daily Review HELPS STUDENTS CLIMB TO THE TOP! What is our focus? From our first day of business to today, we strive to deliver affordable, up-to-date DAILY REVIEW for classrooms across the country. When we say affordable, we mean it. We understand and appreciate a teacher's magical ability to stretch a dollar, so we promise to always give you a high quality, long-lasting product at an affordable price. In 2008, we started producing our own products so that we can have the flexibility and ability to constantly improve and update our products. We continue to correct, add rigor, and/or change a product based off changes to curriculum. We are also proud to say that all of our products are MADE IN THE USA. Is there anything that beats great customer service? In our opinion: NO! We love interacting with teachers. They are the most creative, inspiring, and friendly bunch around. WE NEVER WANT TO LET THEM DOWN! How do you give back without patting your own back? We are very community minded. Whether it is volunteering our time at a local elementary, sponsoring a jr. high's 5k, being board-members to a children's museum, participating in local scouting, joining the school's community council, or setting up scholarships for future teachers at universities, we encourage strong community involvement. We know that there is a lot to accomplish and promise you that our employees will always provide strong service-oriented living. "I just wanted to tell you how much our school has benefited from Mountain Math. One of the teachers heard about the program from her sister who teaches in Northern California. She bought your program. I happened into her room, saw it and wanted it immediately. We began using it and within weeks all the first and secon...(more)d grade teachers wanted the program. The district then ordered it for everyone who so requested. As a result of using your program, bellwork, and a new math series, we have seen a dramatic rise in our test scores in math. Thank you for the good work you are doing to help fill the gap for our students. We all appreciate quality companies such as yours. (less)"